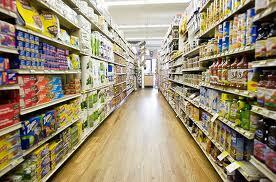 The supermarket is designed to make us spend our hard earned money. It has no qualms about whether you are there with a strict budget or not. Everything about it is laid out and carefully placed, down the to the smallest details in such a way that our mind and eyes will so be attracted to the items that we’ll pick them up and buy them. There are teams of people working for every product on the shelves whose sole job it is, is to ensure their product placement is effective and that sales continue to increase. If they don’t, the product is dropped by the store and a shiny new tempting offer is put in its place, usually with a hefty promotion or discount on it to give it a head start in worming its way into the paying publics heart, otherwise known as the ‘repeat customers’. Once you know this information, you have already won the battle against the splurge. You know that you don’t really want those nice warm, glazed donuts just because they are in that conveniently placed cabinet, or those beautiful fresh flowers, or that lovely, just-baked, crusty bread (you have a loaf in the freezer already! ), or that giant box of Celebrations for $5 or anything down the hair and beauty aisle. You don’t need it, and that pull toward it is simply the big companies effect on your spending senses. Don’t be fooled! – The most regularly bought items will be placed all around the store so that to get to each one you must eventually circle the full range of products to get to it. – The most expensive items are placed at the target audiences eye level (low for children such as magazines and sweets) and high for adults. Also, the easiest to link items are placed near by one another. That is why the baby products are near the hair dye, face creams and make up! No sleep and no time to get to the hair salon means moms are very susceptible to anything which may potentially make them look and feel good again. – The language used to describe the products is often loaded with false advertising. The ‘Finest’ range will have usually been made in the same or similar factory than the branded or own brand/value product. We are made to believe that premium is best and it appeals to our sense of self worth and wanting the best for ourselves where as the value range is stark and bare making it seem less appealing and therefore encouraging us to buy up a brand and spend more money. – Words like ‘discount’ draw us in, and signage which looks as though it is advertising a sale is often used to draw the eye and encourage us to buy. This is a very crafty tactic and often, a cheaper version of the same item may be sat right next to the one with the signage, but yet because of that, we are less likely to notice this. – Buy One Get One Free (BOGOF) offers are often put onto items which quickly go off as opposed to irregular purchases like toilet roll or toothpaste. This is due to the fact that the supermarket would otherwise be just giving you something for free and losing out on you buying it full price next time! BOGOF’s might seem like a good offer but if it’s not going to get used then steer clear. Keep in mind all the supermarkets sneaky ploys and tactics, go in with a list and the cash you have to spend and not a penny more. Do not be pulled in and you will soon see your savings adding up. The posts was contributed by WickedFreebies.co.uk the UK’s up and coming freebie and money saving website.